Mrs. Valarie Gean Carter (aka) Peaches, was born on April 26, 1953 in Milwaukee to Mary Louise Harris of Iowa and Herbert Gean Gibbs of Ohio. Valarie graduated from Garfield High School in Seattle, WA and became a model for B.B.W. Magazine. After moving to Sacramento, CA, Valarie began working as a in home care provider. She was a beautiful soul, and she inspired, encouraged and loved all the people she came in contact with. 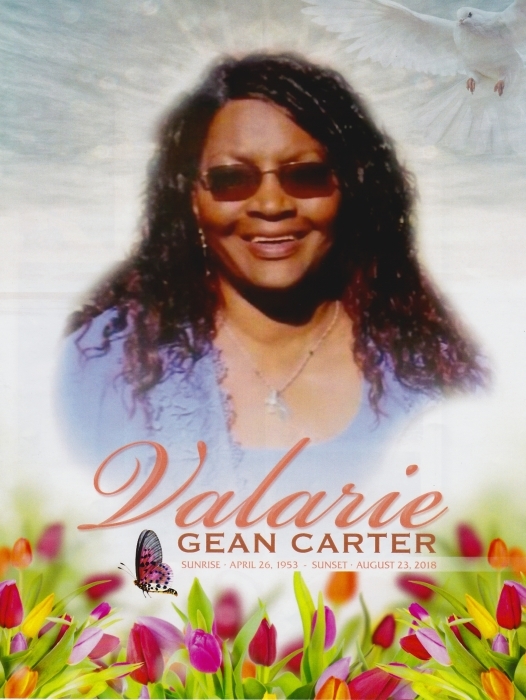 Valarie Gean Carter went to be with the Lord peacefully on August 23, 2018 in Sacramento, CA, where she finally ended her fight with Cancer. Valarie is survived by her son Marcus D. Bell, Sr., and daughter-in-law Felicia Bell of Sacramento, CA, grandchildren Kenan M. Jackson, Marcelous D. Bell, Asia M. Bell of Sacramento, CA, Marcus D. Bell II. and Mary Louise Bell of Sheldon, SC, twin brothers Michael and Milton Williams of Seattle, WA and a host of nieces and nephews who loved her deeply. She is preceded in death by her mother Mary Louise Harris of Iowa, father Herbert Gean Gibbs of Ohio, and sister Cheryl Stinson of Seattle, WA.